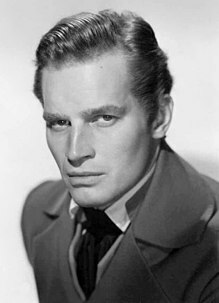 Ni Charlton Heston (naiyanak a kas ni John Charles Carter wenno Charlton John Carter; Oktubre 4, 1923 – Abril 5, 2008) ket maysa idi nga Amerikano nga aktor ken aktibista ti politika. ^ Berkvist, Robert (Abril 6, 2008). "Charlton Heston, Epic Film Star and Voice of N.R.A., Dies at 84". The New York Times. Naala idi Abril 6, 2008. Charlton Heston, who appeared in some 100 films in his 60-year acting career, but who is remembered especially chiefly for his monumental, jut-jawed portrayals of Moses, Ben-Hur and Michelangelo, died Saturday night at his home in Beverly Hills, California. He was 84. Daytoy a panid ket naudi a naurnos idi 2 Oktubre 2018, 19:07.